Reason has an article on "Peak Oil Panic", which offers an introduction to the subject via a fairly standard recital of the peak oil litany, then rapidly disappears off in to an abstract realm of free market thinking - their solution - make all those pesky socialists and other national oil company bureaucracies hand over the black suff to the fine folk at Chevron and Exxon, who will exploit the fields much more quickly an effectively than a bunch of leftist layabouts could ever hope to manage. They don't appear cognizant of the fact that exploiting a finite resource faster doesn't make the problem go away - but then, they appear happy enough to believe Lynch, Economides, Yergin and the other optimistic forecasters of global oil recovery potential (ignoring the global warming problem of course). Is the planet running out of gas? If it is, what should the Bush administration do about it? The Princeton geologist Ken Deffeyes warns that the imminent peak of global oil production will result in “war, famine, pestilence and death.” Deffeyes, author of 2001’s Hubbert’s Peak: The Impending World Oil Shortage and 2005’s Beyond Oil: The View from Hubbert’s Peak, predicted that the peak of global oil production would occur this past Thanksgiving. Such forecasts have been bolstered by a steep rise in oil prices over the last three years, going from $18 a barrel in 2002 to $70 last fall. If the price of something goes up, after all, that means it’s becoming scarcer. Refurbished cold warrior Frank Gaffney, president of the Center for Security Policy, opposed the $18.5 billion bid by the China National Offshore Oil Corporation for the California-based oil company Unocal last year. “It’s a very ill-advised transaction,” said Gaffney. “It’s not in our interests to turn over more of our finite resources to others. They should be taken off the market.” Our finite resources? Seventy percent of Unocal’s reserves and production are located in East Asia and the Caspian Sea region. Ilan Berman, vice president for policy at the American Foreign Policy Council, regretted that “energy is not viewed through a national security prism. We should be competing to lock up supplies and diversifying and exploring new technologies.” Berman argued that as resources become scarcer there is no way to avoid a zero-sum game. “We have to approach this through the lens of the haves and have-nots,” he declared. From far (albeit libertarian) right to far left, Energy Bulletin points to an article from the Socialist Equality Party on the World Socialist Web Site (and yes, I'm always amazed these things still exist too) called "A socialist response to the massive rise in fuel prices". Some 70 percent of US adults recently polled said gas prices—which are up 31 percent since last year—were causing them financial hardship. Tens of millions of people in America forced to drive long distances to work, as well as elderly people on fixed incomes, rural residents and small business owners are being devastated, and the crisis could lead to mass layoffs in the airline and trucking industries and throughout the economy. ...While the oil companies and their apologists in Washington have blamed world crude oil prices and environmental regulations for the price hikes, the chief cause is profiteering by oil companies, which are posting record windfalls. ...That the present reliance on petroleum is both unsustainable and a deadly threat is indisputable. The world’s crude oil reserves are finite and will only disappear all the more rapidly to the extent that steps are taken to expand production. At the same time, the burning of these fossil fuels is the central cause of global warming, which—the Bush administration’s suppression of science notwithstanding—threatens to make Earth uninhabitable. Moreover, the pursuit of this finite resource has given rise to the catastrophic growth of militarism. Bart makes some comments which are in line with my thinking on the prospect of a leftist revival and outlines the various forms of the political left, which could be a handy road map for those "conservatives" whose monomania has led them into the misguided belief that liberalism is somehow akin to communism. As rising oil prices exert hardship on working and middle classes, I think we can expect a resurgence of leftist and populist politics. The website in which this article appears (About Us) is Trotskyist, generally agreed to be on the left of the communist spectrum. Other communist parties include the Maoist (for example in Nepal) and mainstream (for example in Cuba). By definition, "communists" are Marxist-Leninists - they follow the doctrines of Lenin. In contrast, socialists and social-democrats (such as labour parties) generally reject Lenin's ideas. Anarchists usually reject Marx as well. In the past, differences between the various groups have been heated and often fratricidal. In my opinion, no Marxist group has ever been very good on resource and environment issues - witness the call to cap gas prices in the above article. In recent years, some independent Marxists have been attempting to combine Marxist and green ideas, for example, the late Mark Jones and John Bellamy Foster. 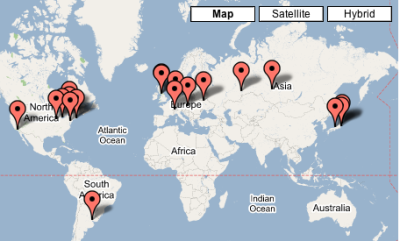 Boing Boing points to a map of historic nuclear accidents on the 20th anniversary of Chernobyl. Tom Paine points to an article in The Nation on Chernobyl and the collapse of the Soviet Union - "Remembering Chernobyl". Twenty years have passed since Chernobyl's Unit 4 reactor exploded on April 26, 1986. In the months following the disaster, 116,000 residents from 188 towns and villages were evacuated, leaving an area nearly twice the size of Rhode Island uninhabitable. And although partisans from both the pro- and antinuclear lobbies continue to debate the number of deaths directly attributed to the disaster, the allure of nuclear energy has only grown in the past decade. Today, the Exclusion Zone remains a depopulated field experiment, part wildlife sanctuary and, increasingly, a destination for tourists. Early this year, the Speaker of Ukraine's Parliament suggested that extreme tourism might be the only way to "derive some practical good out of this tragedy." And for a few hundred dollars, writes Peter Finn of the Washington Post, the adventurous traveler can spend a day in the Exclusion Zone, wander the empty streets of Pripyat, whose 45,000 residents were evacuated after the explosion, and observe the Unit 4 reactor, one of the few monuments left. Chernobyl itself, like the villages and towns that once supported the eponymous power plant, has largely disappeared from the public imagination. The survivors too have disappeared, their stories eclipsed by the dramatic collapse of Soviet Communism and the intangible experience of those who, as Svetlana Alexievich notes in her devastating collection of monologues, Voices From Chernobyl, "are already living after the nuclear war." Chernobyl in many ways foreshadowed the precipitous decline of the Russian countryside following the dissolution of the Soviet Union. Village life is dying. Life expectancy continues to fall and is among the lowest in Europe. Young people, if they can, are leaving for cities. Chernobyl was one of many headaches faced by Mikhail Gorbachev as he presided over the downfall of the USSR - as a man with first hand experience of the political fallout associated with nuclear accidents, Gorby is wisely counselling the world to adopt renewables, not nuclear. The guy who effectively ended the Cold War (aka ’my nuclear arsenal is bigger than yours’), and had to manage the cleanup of Chernobyl, has this to say on a topic doing the rounds at the moment: “Nuclear power is neither the answer to modern energy problems nor a panacea for climate change challenges,” President Gorbachev said recently. “You don’t actually solve problems by finding solutions that create more problems down the track. It doesn’t add up economically, environmentally or socially. Of all the energy options, nuclear is the most capital intensive to establish, decommissioning is prohibitively expensive and the financial burden continues long after the plant is closed. In the U.S., for example, direct subsidies to nuclear energy amounted to $115 billion between 1947 and 1999 with a further $145 billion in indirect subsidies. In contrast, subsidies to wind and solar combined during the same period totaled only $5.5 billion.” An extract from his press release, commemorating Chernobyl 20 years on, in which he beseeches the leaders of the G8 to show some spine, and support solar energy with a global fund of $50 billion USD. Tom Paine also has an article on "The Oil-man in chief". You know President George W. Bush’s ratings are in the toilet when he starts bashing oil companies in the name of protecting what he repeatedly called “our consumers,” as he did yesterday. And you know the Party in Power—just back from getting an earful from angry constituents about rising gasoline prices—is shaking in its shoes at the prospect of tomorrow’s (April 27) profit announcement by ExxonMobil. So the president did what a floundering politician does: he tried to change the subject. In this case, the president made the environment a scapegoat for rising gasoline prices. He suggested a false choice—lower prices at the pump, or dirtier air. One last one from Tom Paine - this one on "Hybrid Solutions"". Increasing fuel economy is essential, but in the long run we will need cars powered by ethanol or hydrogen or green electricity to solve the oil problem and eliminate global warming pollution from our cars and trucks. The challenge is that no one knows which fuel to bet on. Many promoters of alternatives are busy overselling their fuel’s virtues and emphasizing the shortcomings of their “competitors.” In charting the unexplored territory beyond petroleum, it’s the equivalent of circling the wagons and shooting inward. As a result, our political leaders fumble around for a magic silver bullet amidst a cacophony of conflicting advice. As any savvy investor will attest, the smart money is on a diverse portfolio, supporting all alternatives in hopes that one or more will succeed. Ethanol needs a sustainable, cheap feedstock and better ways to brew the fuel. Hydrogen-powered cars require technology breakthroughs and clean sources of hydrogen. Electric cars need much cheaper batteries and renewable electricity to replace dirty energy from coal plants. All three fuels need infrastructure support to compete with the country’s 180,000 corner gas stations. Transforming transportation won’t come through research investments alone, however. While the auto or oil companies have never met a government regulation they liked, history has repeatedly demonstrated that market forces alone can’t solve the problem. From leaded gasoline to seat belts to fuel economy standards, these companies have routinely needed policy prodding to do the right thing by consumers and their health. That is why our elected officials must require Detroit to use off-the-shelf conventional fuel economy technologies, boost sales of green hybrids, and invest today in all of the fuels of tomorrow. The road map is clear. Now we just need to get moving. Renewable Energy Access points to a conference in Washington DC on peak oil and global warming - glad to see the idea that these two topics are inextricably linked is now becoming widespread. A three-day conference to address the implications of two overlapping global crises -- the coming peak in worldwide oil production and the continuing disruption of ecosystems due to global climate change -- convenes in Washington, DC, from May 7 to May 9 at the Marvin Center (800 21st St. NW). "The problem of the peaking of world conventional oil production is unlike any yet faced by modern industrial society." The Sustainable Energy Forum 2006 is sponsored by the University of Maryland's Conservation Biology & Sustainable Development program. It is co-sponsored by Wallace Global Fund, Sustainable Scale Project, NRDC, and NRG Wind Systems. With this year's theme on "Peak Oil and the Environment," the conference offers more than 20 leading sustainability thinkers, scientists and policymakers exploring the challenges of oil production peaking, and its implications for the economy, climate, geopolitical stability and human well-being; and possible adaptations, including alternative energy sources and reducing energy use. "The problem of the peaking of world conventional oil production is unlike any yet faced by modern industrial society," said a recent Department of Energy commissioned study, whose co-author, Roger Bedzek, is a conference speaker. Also speaking will be James Hansen, director of NASA's Goddard Institute for Space Studies, who made headlines recently by exposing the Bush administration's attempts to censor him after he called for quick reductions of greenhouse gases. Other speakers include Congressman Roscoe Bartlett (R-MD), who organized a House caucus on Peak Oil; Lester Brown, president of the Earth Policy Institute, who addresses the problems Peak Oil poses in his new book "Plan B 2.0"; and Montana Governor Brian Schweitzer, a proponent of domestically produced energy sources, including wind. Mona Sahlin, Sweden's minister for Sustainable Development, will discuss her country's initiative to be free of oil dependence by 2020. Additional presenters include Michael Klare, author of "Blood and Oil"; former World Bank economist Herman Daly; Robert Costanza, Director of the Gund Institute for Ecological Economics, and several other authors in the field. TreeHugger reports Lester Brown's "Plan B: 2.0" is now available for free online. Maybe we should call this week the "Lester Brown Week"? On Monday we asked you for suggestions of interview questions, on Tuesday the TreeHuggerTV team interviewed Mr. Brown (stay tuned for the episode featuring the interview) and today we'd like to let you know that his book Plan B: 2.0 (which we've covered before) is available online for free (legally, of course): Plan B 2.0: Rescuing a Planet Under Stress and a Civilization in Trouble. You can read it in a browser, or download chapters in .pdf format, but of course you can also buy it to support Mr. Brown (and when you're done reading, why not donate your copy to the local library or start a library at work?). A quick scan of the local paper for energy news - Caltex says - $1.40 per litre: get used to it, Woodisde is planning to spend $900 million developing the Tiof field offshore Mauritania, Oil Search has doubled their profits since last year, Bush's move to stop refilling the strategic petroleum reserve got some coverage (no one notes the risk this poses in the event of a bad hurricane season this year), Iran says it will fight back if attacked - with the next UN meeting on their nuclear program in 2 days time and Australians look like getting an RFID based national ID card by 2010. Billmon has a post on America's "Blessed Addiction". The prices that people are paying at the gas pumps reflect our addiction to oil. Addiction to oil is a matter of national security concern . . . These countries know we need their oil, and that reduces our influence, our ability to keep the peace in some areas. The President believes that it's an American way of life, and that it should be the goal of policy makers to protect the American way of life. The American way of life is a blessed one . . . The President also believes that the American people's use of energy is a reflection of the strength of our economy, of the way of life that the American people have come to enjoy. Jeff Vail has a post on the possibility of "Bifurcation". In my start-of-2006 prediction, I called 2006 the “year of the balance beam.” We’re in a pretty precarious position, and a good jolt could send us right off the edge, but without that shock we will probably keep on walking in a straight line. We’ve had many close calls. The end of the Cold War was probably our last great wobble. We swung our arms about and did a little dance, but we weren’t really in any great danger of falling off. 9/11 was a slight trip—and it took us a moment to regain our balance. But balance regained, we’ve regained confidence, and perhaps we’re moving forward a bit faster than is prudent (in our shiny yellow H2 short bus). Now we’ve realized that we’re unstable again—our arms are just now quivering, wondering how to react to the next blow, and our legs are a bit shaky. There’s uncertainty—will we catch our balance quickly, will we pirouette and nearly fall off but regain control, or is it one with the abyss for humanity? You can see this clearly in oil prices, which hit record highs this week without a hurricane. The combination of supply-demand issues and wondering about Iran has left us in limbo. Will we catch ourselves this time? What about the next? It’s really only a matter of time now. Most likely we’ll catch our balance this time—and you’ll see this reflected in oil dropping below $68/barrel. And most likely we’ll catch our balance next time, too. But the balance beam is getting narrower. Will a major Gulf hurricane knock us off for good? What about Iran closing the Strait of Hormuz? What about a collapse of oil production from Ghawar? What about China continuing to grow oil demand by double digits annually? India? What the future looks like will depend in part on what catalyst knocks us off. But one thing is certain—after the bifurcation point we aren’t walking down the same straight line any longer. To close, here's a video from Japan showing the increasing popularity of bike riding. Thanks for all your work in bringing all this information together for us. Im a big fan of your blog and read it every day. Even though im new to this Peak oil caper it's enough to scare the socks off me. Good on old Boris for speaking out against Nuclear energy. Im convinced it's not the future for our world. I was reading a pro nuclear article on theage.com.au yesterday, it totally doesn't convince me. Thanks for the feedback - glad you enjoy my periodic assembling of all this stuff. Don't stress about peak oil too much - its not completely out of the question that some of the more extreme doomer scenarios eventually occur but it doesn't seem likely - there seems to be more than enough energy out there to keep us going if we choose to harness it (rather than remaining captives of the oil and coal industries). As for Gorby, he seems pretty shrewd on a lot of topics - nuclear ain't the answer to anything - renewables offer a large (and undepletable) amount of energy which should be top priority - which some of the smarter European countries realise. Post pro nuclear articles just smell like PR to me (and there is no shortage of evidence that this is often exactly what it is).